Six months ago Hayley Raso broke her back and thought she may never walk again. Now her dream to play at the Women's World Cup is back on. 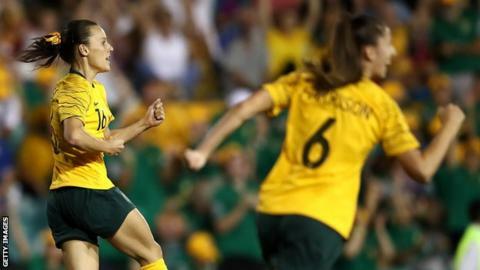 The 24-year-old Australia winger made her international return on Thursday, coming off the bench to score against New Zealand in a 2-0 win in the Cup of Nations in Sydney. "It was just overwhelming for me," she said. "I'm just so excited to be out here playing again and to get a goal topped it all off." Raso fractured three vertebrae in August 2018 while playing for Portland Thorns in the Women's Soccer League in the US after colliding with Washington Spirit goalkeeper Aubrey Bledsoe. "My first thought was, 'I'll never be able to walk again'," she said in an interview with the Australian football union in September. "I broke down. So many emotions came over me. All I could think about was 'how am I going to live my life like this?'" She spent a week and a half in hospital before a gruelling rehabilitation as she learned to walk again. Raso progressed from a wheelchair to a walking frame, before finally taking her first steps. "I had a few episodes where I passed out because of the pain and I went into shock," she told ABC. "Eventually I was able to get up, slowly and with a lot of help. I was just taking really small steps trying to get around the hospital." Raso made her comeback for Brisbane Roar in January, writing on Twitter: "This injury pushed me to my absolute limits. "This whole journey was an extreme mental and physical battle. I didn't think I'd make it out, but I am so happy to start my next chapter." Her next goal will be making Australia's squad for the World Cup in France, which starts on 7 June.